A major new extension to Aston Nature Reserve, on the Montgomery Canal was undertaken by Stephen while working for British Waterways. 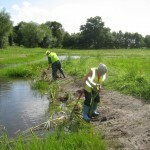 The work was part of restoration of the canal, an important SSSI, designated for its wide range of aquatic plants. 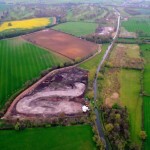 As part of a unique sustainable restoration a major new nature reserve was constructed using water flowing around Aston Locks. This phase included the creation of a new pond nearly two acres in size. . 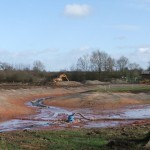 The chosen site was waterlogged peat overlying sand, but the pond system required lining, to maintain water levels in the canal and connectivity for the aquatic plants. 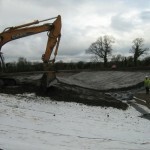 The chosen solution was to use a flexible bentonite matting liner, with a continuous pumping system to keep the site dry during construction works. The project was designed and managed by Stephen, with Morrison Construction as the main contractor. Total project value was £400,000. The project won the 2007 Waterway Renaissance Award in the environmental category.